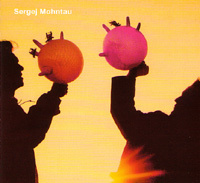 Rubberglovebagpipes is the name of an instrument and at the same time the titel of the first Sergej Mohntau Live-Performance, developed between 1999 and 2002. Musical instruments are used as utensils and objects of utility as musical instruments. Besides the Rubberglovebagpipes other instruments like the Electric Window, the Jack-Of-All-Trades Double Bass and Selfmade Hardcase-Laptops have been created. In combination with human voices and electronic devices various pieces have been generated. The compositions follow the specific sonic features of the adapted utensils and lead to different musical styles. A common sound generated from both analog and digital sources encased in a dramaturgical concept based on mechanics, electricity, and electronics. Music as the language of objects.